Believe it or not, I go back on some of these posts to reference the items myself. If you’re interested in more resources, check out the Design Share Blog, which has lots of fun goodies, all categorized by tag with TOU references as well. If you’re curious about that blog’s inception, you can read about it in the Design Share Launch post. Yw, I live for comments, so much appreciated. I was thinking of posting some ecru layer styles some time soon. as a "virtual lace" resource, lol. Those designs are just so amazing. The colors made all designs more attractive. I wish that I can also make a design like that. 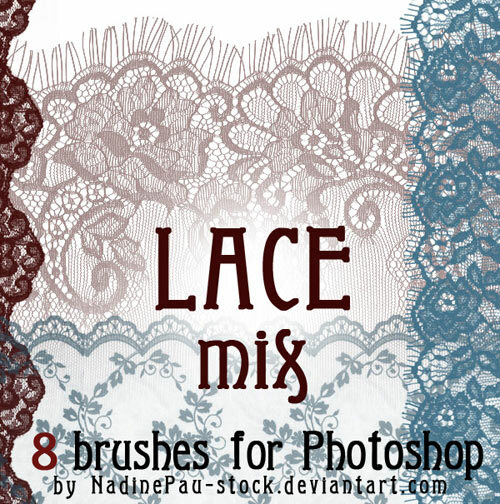 Great post, I was searching n my own for lace brushes and couldn't find anything I liked, glad I stumbled across this post. Its really great post regarding the design of Vintage graphics. I also like to create an excited wallpaper related to the Vintage.